State handouts cannot continue indefinitely, not least because reserves no longer cover total foreign liabilities: on the basis total debt was US$540bn at the end of September 2008, and that US$73bn was repaid in the fourth quarter, total debt is now US$467bn and private-sector debt US$425bn. Russia entered the crisis with the world’s third largest cache of central bank reserves, but it has been dwindling at an accelerating pace. By mid-January, reserves had declined to just below US$400bn, meaning that more than a third of the total was spent over the past five months. Longer post coming over the weekend. 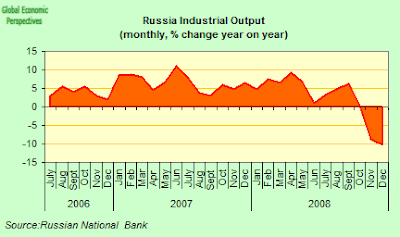 Russian industrial production dropped sharply again in December - by the most since at least 2003. Output was down 10.3 percent following an 8.7 percent fall in November, according to data from the Federal Statistics Service announced yesterday (Thursday) by central Bank Chairman Sergey Ignatiev. Output growth for the year was 2.1 percent, the slowest since at least 1999. Manufacturing fell an annual 13.2 percent in December, compared with a decline of 10.3 percent in November, as steel-pipe production dropped an annual 35.3 percent and coking coal output plunged 44.2 percent. Truck production plummeted 67.1 percent. 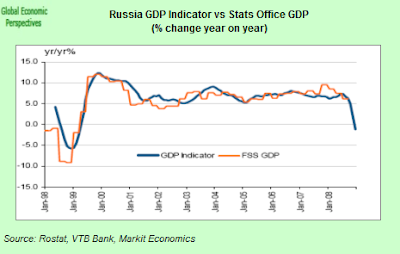 This data is not surprising, and only confirms what we have been seeing in the VTB PMI. The next interesting data appointment will be on 2 February, when we should get to see what happened in January. Russia’s international reserves fell $30.3 billion last week, the second-biggest drop on record, as the central bank accelerated the rate of the ruble devaluation and sold increasing quantities of foreign currency in an attempt to manage the pace of the decline. Russia’s reserves have now fallen 34 percent from the record high of $598.1 billion in August while the ruble has fallen 29 percent against the dollar over the same period. Some of last weeks decline can be attributed to the dollar’s 1.5 percent gain against the euro in the week ended January 16, since this means a fall in the dollar value of the other currencies in the reserves. Evgeny Nadorshin, senior economist at Moscow’s Trust Investment Bank, estimates that about $18.3 billion of the drop can be accounted for by central bank interventions last week. 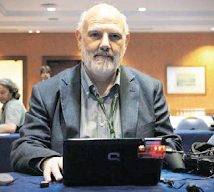 (The reserves are made up of 44 percent euros, 45 percent dollars, 10 percent pounds sterling and 1 percent yen). The Ruble continued to fall today (Friday) after the central bank announced last night that it was “finished” with its gradual devaluation of the ruble and was going to let “market factors” help determine the level of the currency. The bank set the weakest end of the currency’s trading range against a target basket of dollars and euros at 41 as of today, or 36 per dollar, at a USD of around 1.3 to the euro. Bank Rossii has now widened the currency trading band 20 times since mid-November as it seeks to rebalance Russia's economy amid plunging oil prices and the global financial crisis. Following yesterdays announcement the ruble fell again this morning, dropping 1.5 percent (to 33.1073 per dollar), extending this weeks decline to 1.8 percent. The ruble depreciated today to 33.1710 per dollar, its lowest level since early 1998. 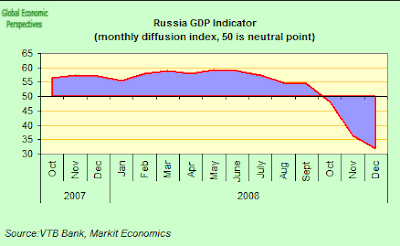 The ruble has lost 7.7 percent since official trading resumed this year, extending the decline to 29 percent since August, 2008. Investors have now withdrawn $245 billion from Russia since August according to data from PNB Paribas. Russia’s reserves, which are the world’s third-largest, fell by $171.6 billion to $426.5 billion between August and Jan. 9. Bank Rossii, which manages the ruble against a basket of about 55 percent dollars and the rest euros, widened its target range again today. The currency has fallen 29 percent versus the basket since Aug. 1 and is now able to decline about 22 percent from a target rate, from about 3.6 percent on Nov. 11, the start of the current round of depreciation. The ruble weakened 1.4 percent to 37.8224 against the dollar-euro basket by 5 p.m. today in Moscow, extending this year’s drop to 6.7 percent. It depreciated to 43.8880 per euro, the lowest since the common currency’s introduction in 1999, and has lost 5.7 percent this year. The ruble weakened 5.3 percent against the dollar and 9.8 percent versus the euro last week, the most since 1999. That compares with a record 71 percent slide in the week to Aug. 28, 1998, and a 42 percent slump the week after. Russia’s Mosprime rate, the average interest- rate banks charge to lend money to each other, rose to a two- month high of 12.5 percent today, according to the central bank. Russia’s economy will probably grow more slowly this year than earlier forecast as the price of oil, the country’s chief export earner tumbles, according to Merrill Lynch & Co. 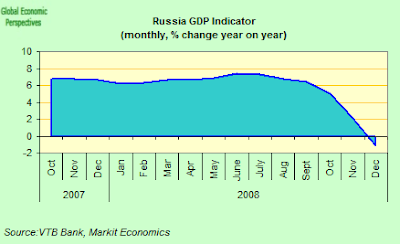 Gross domestic product will probably expand 0.9 percent, rather than the previous projection of 3.7 percent, Merril’s Moscow-based economists Yulia Tsepliaeva and Ivan Bokhmat wrote in a report sent to clients.